Works Progress owner Marnee Chua. 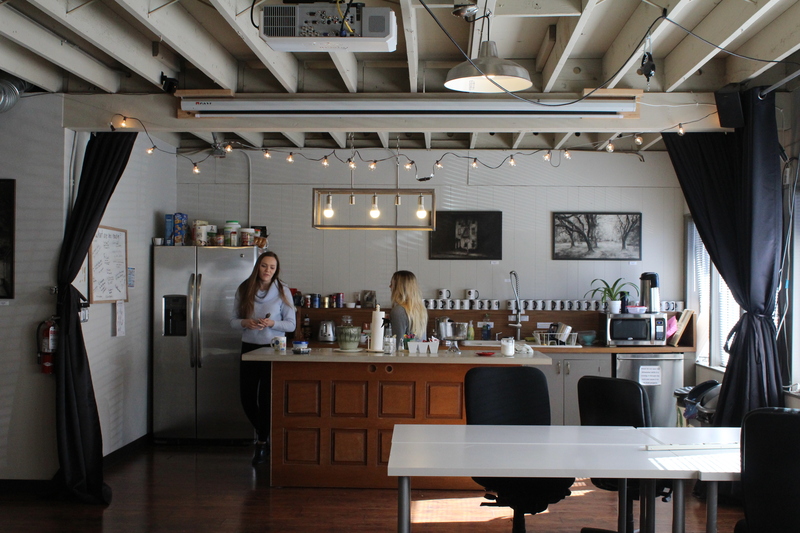 Coworking spaces are an increasingly popular option for small businesses, freelancers and entrepreneurs, and north Seattle businesses don’t have to look far to join a great coworking community. Works Progress is a coworking space located in Seattle’s Greenwood neighborhood, owned and operated by Marnee Chua since 2012. Marnee met a business partner with a similar vision, and the two worked hard to find a space that would allow for a combination coworking space and childcare center. They chose the location on North 85th Street with the goal of incorporating childcare in the future, but eventually had to abandon that idea. The member kitchen at Works Progress. While an in-house childcare option never materialized at Works Progress, the business is still family-friendly and flexible. Members are welcome to bring their children in as long as it doesn’t cause disruption. Marnee also helped convene the group who started The Inc, a non-profit offering coworking and childcare in Greenlake, where she often refers people who have childcare needs. One of the Office of Economic Development’s very own Small Business Advocates, AJ Cari, also holds regular office hours at Works Progress. AJ has a long-standing relationship with the business—Marnee first met him when he was conducting outreach with the businesses impacted by the 2016 Greenwood explosion (right around the corner from Works Progress). “I met AJ since he’s been out in the community. Now, I have someone to call if somethings goes wrong,” she says. Marnee Chua and Small Business Advocate AJ Cari. If you’re thinking of opening your own business, Marnee recommends taking advantage of resources like OED’s team of Small Business Advocates—especially before taking big steps like signing a lease. “There are so many ways that the lease can be set against the business. Especially brand new businesses, they’ll sign a lease that is not good for them,” she says. OED has a commercial lease checklist available online to help small businesses negotiate favorable leases, and businesses can contact us anytime for one-on-one assistance. Marnee is excited for the next step in Works Progress’s journey: the business is exploring how to become a member-owned cooperative. “Members are excited about it as a way of having a little more investment in the space and say in what happens. I think the biggest interest that everyone has is for the long-term succession plan of the business itself, because it is a nice community, it’s something that people want to stay at as long as they can,” she explains. If and when Works Progress switches to a co-op model, Marnee believes it will be the first member-owned coworking space in the United States (as far as she’s been able to find from online research). If you’re looking to join a welcoming, geeky, laid-back coworking community, you can find Works Progress at 115 N 85th Street, Suite 202, in Greenwood. Keep up with them on Facebook and Twitter too. If you’re interested in learning more about our small business services and resources, shoot us an email at oed@seattle.gov. David Fu at his restaurant. 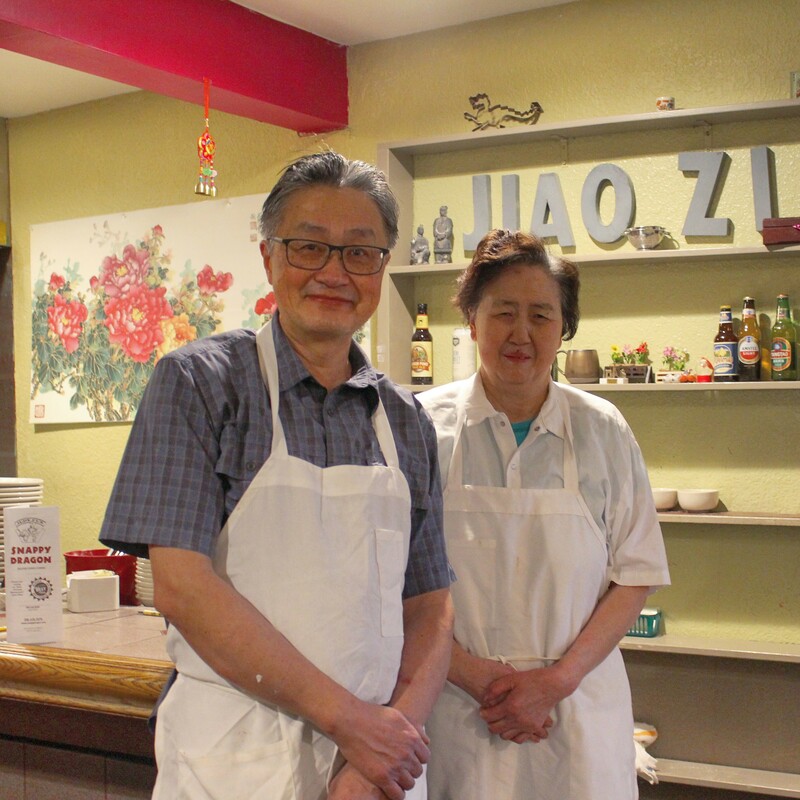 Judy Fu’s Snappy Dragon has been a staple of Seattle’s restaurant scene for decades. 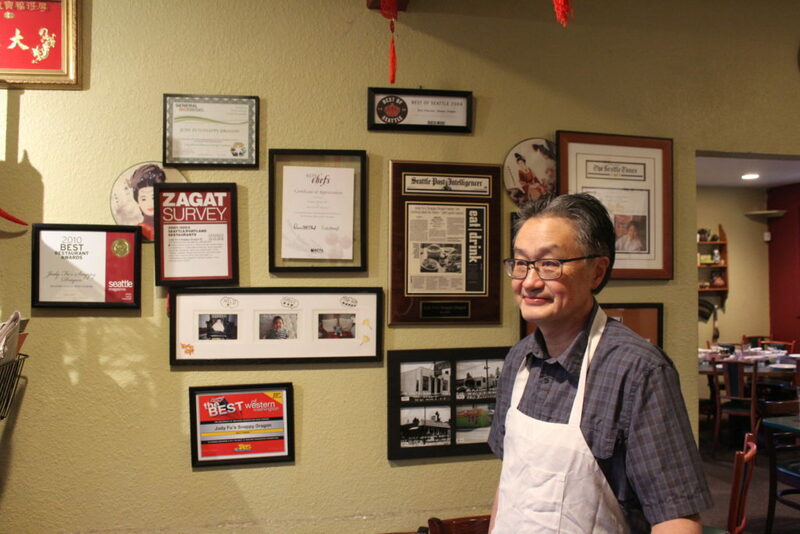 The nine-time winner of King 5’s Best of Western Washington Best Chinese Restaurant and one of CNN’s 50 best Chinese restaurants in the United States, Snappy Dragon has been family-owned and operated in Maple Leaf since opening its doors in 1993. Opening the restaurant was intimidating for the family. “It was really kind of scary, because of the amount of money we had to borrow from the bank,” David remembers. But Snappy Dragon soon earned a reputation for Judy’s Mandarin/Szechuan-style cooking, getting rave reviews and becoming a popular neighborhood destination. Lots of things have stayed the same throughout Snappy Dragon’s 26 years in business. While David has taken over the business, his mother Judy still comes in to work daily. The restaurant is still best known for its handmade dumplings and noodles. (Both come highly recommended from David—he makes the dumplings himself, and his mom makes the noodles.) Even the cartoon dragon coloring page for kids has stayed the same. Judy Fu’s many awards and reviews on display. If you’re thinking of opening your own business—particularly a restaurant—David recommends having patience. “In the beginning it’s very slow business, but you just have to stay on your course.” He also stresses the importance of treating your staff and customers with kindness and respect. Stop by Judy Fu’s Snappy Dragon at 8917 Roosevelt Way NE in Maple Leaf, and keep up with them on Facebook. 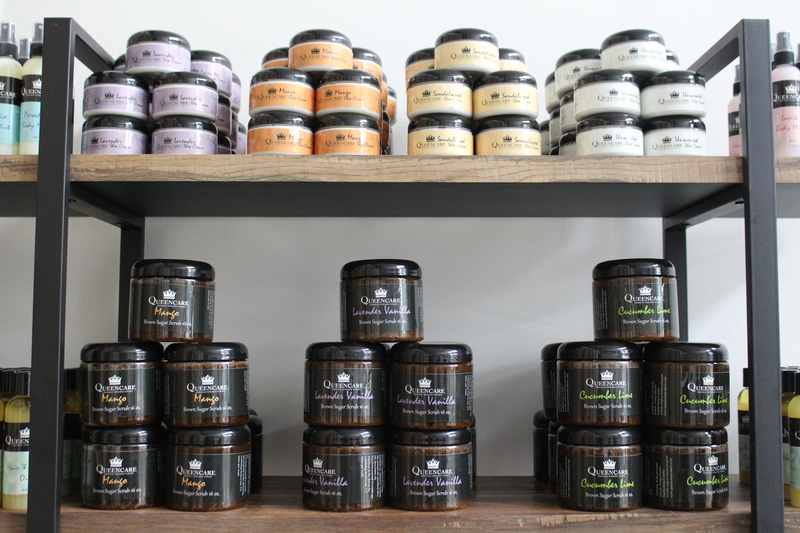 You can even find Judy Fu’s very own line of sauces at local grocery stores. Learn about how the Office of Economic Development supports like Judy Fu’s by visiting our website, and reach out to us anytime at oed@seattle.gov. Estelita’s Library founder Edwin Lindo with Small Business Advocate Domonique Meeks. The books in Estelita’s Library are not organized by author’s last name, genres, or by any other particular system. “For us the structure is very simple,” says Estelita’s founder and curator, Edwin Lindo. “The door tells you what section of the bookstore this is. 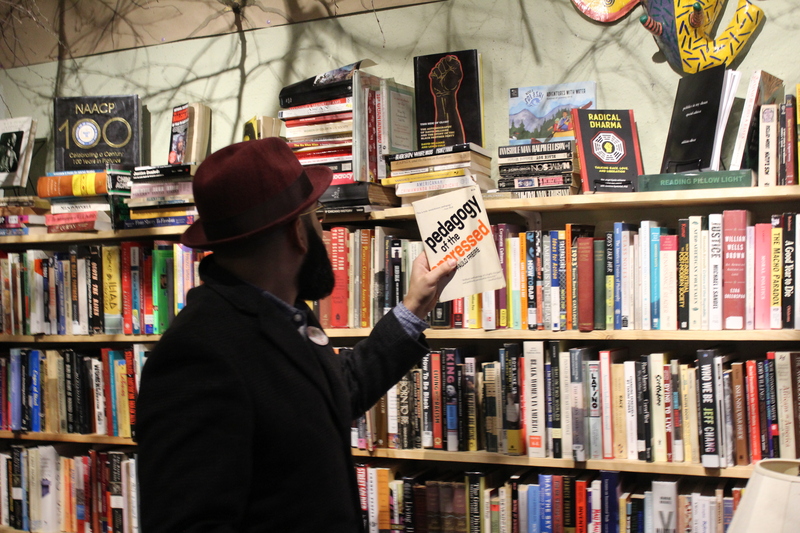 It’s Estelita’s Social Justice Library.” The library is located in Seattle’s Beacon Hill neighborhood. The absence of defined sections plays into Estelita’s mission: giving the community a space to come together and expand horizons through culture and conversation. Inspired by similar spaces in Edwin’s childhood growing up in San Franscisco’s Mission District, and named after Edwin and his partner Estell’s first born, Estelita’s Library reactivated the space carrying its legacy as a place for community to speak openly about politics, history and the neighborhood. Since May, the books on the shelves have served as centerpieces and conversation starters. Edwin spoke about the importance of community space to host events, have open dialogue or just sit quietly and read. Guests can buy wine or other refreshments and books are available to borrow or purchase, but you don’t have to be a paying customer to come in and enjoy the space and read for as long as you’d like. Edwin grabs his favorite book, Pedagogy of the Oppressed. Edwin helps provide posters like these to local teachers. “There’s something powerful for community, for myself, to be able to say, ‘We have a space.’ Unconditional space. No strings attached,” he says. When Edwin says the space is community-run, he means it. People can take books as they please without worrying about late fees, and if Edwin needs to leave Estelita’s early or can’t be there when it opens, he trusts others to open or close up shop for him. If you’re interested in learning more about the Office of Economic Development’s small business services, visit our  website  or reach out to us at oed@seattle.gov. Owner Isolynn Dean (known as Ice). Cortona Café is “a café in Seattle’s Central District that puts community first.” Located on the corner of East Union and 25th, Cortona is a cozy two-story café, art gallery and event space curated for community conversation. Owner Isolynn Dean—who mostly goes by Ice—is one of those community members herself, living only a few houses away. Born in Carson, California, Ice arrived in Seattle in 2011 as a transplant from St. Louis. She initially moved in with her sister and her brother-in-law Jason, who lived in the Central District. At the time, Jason owned the café, and Ice began working there as a barista. 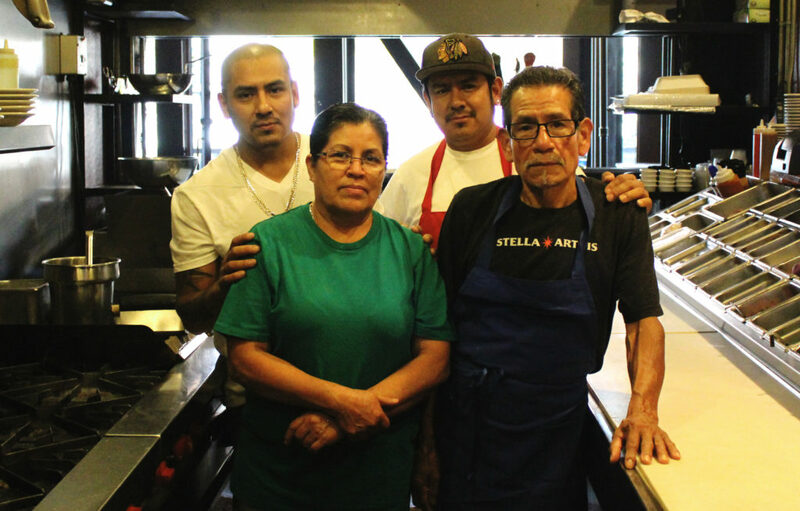 The community Ice has been able to find in the Central District has kept her living in the neighborhood through her nearly eight years in Seattle, and she reflects the way that the neighborhood embraced her in how she runs her business and treats her customers. “The Central District used to be very diverse. And it still feels like city, but it also feels like neighborhood. It feels like community. We talk to each other, we help each other. And I think with [Cortona Café]—before I got here, and since I’ve been here—I feel like I’ve created a little hub where people can come and get to know their neighbors. People will come here and they’ll talk to random strangers,” she says. Ice credits family and community members for assisting her along the way as a new small business owner, and she also took advantage of free mentoring through one of our partner organizations, Greater Seattle SCORE. Her mentor, Scott, had experience as a business owner and was there to give advice: “We would meet up for coffee. Any questions I had, any frustrations, he would pretty much answer them within the first two minutes.” Office of Economic Development staffer Mikel Davila also built a relationship with the business, coming by to let Ice know about funding opportunities available to her. Ice doesn’t plan to run Cortona forever, but before she leaves, she hopes to mentor and groom the next owner so that the café can continue to be a safe, beautiful, comfortable, legacy space for years to come. If you’re interested in learning more about mentoring through organizations like SCORE, or other services for small businesses, visit our website or reach out to us at oed@seattle.gov. Connect Lounge in Belltown has its mission engraved on its communal tables: “Building a community, one conversation at a time.” Through her business, Iulia Bejan is creating a welcoming space where guests are free to chat with old and new friends over craft cocktails and appetizers. Connect Lounge encourages customers to get to know each other through its communal tables, conversation starters, a “phone-free happy hour” and more. Iulia speaking with OED staff. Born in Romania, Iulia lived and worked in Africa and Europe before moving to the United States ten years ago. She worked at Amazon for four years prior to opening Connect Lounge. “I’ve known for the longest time that, you know, one day I would do my own thing,” she says. Iulia knew she wanted her business to channel her love of hearing peoples’ stories and building connections between people. Opening a bar was a natural choice as somewhere people can spend hours talking and getting to know each other. Opening Connect Lounge presented unforeseen challenges Iulia did not expect. “Finding a space was one of the bigger hurdles,” she says, explaining that it took nearly two years of searching, and nine months of back-and-forth with the landlord and other involved parties, to secure her Belltown location. Securing financing presented its own challenges. Iulia noted that banks did not value the experiences she brought to her new business from the tech industry. Iulia was rejected by all of the banks she reached out to, but one bank referred her to Business Impact Northwest, who ultimately approved her for a small business loan. Through a combination of funds from the loan, a Kickstarter campaign and personal funds, Connect Lounge opened in May 2018. Customers will be greeted with the “Inspire Me Seattle” wall on their left when they walk in the door, featuring information on members of Seattle’s small business community who Iulia finds inspirational, and the colorful Connect Wall on their right, which is decorated with words, phrases and pictures that patrons find inspirational or meaningful. “When we opened five months ago, the Connect Wall was empty, so the fact that right now it’s almost full, I feel like that shows that people do want to be seen, do want to express themselves, and want to be part of a bigger community,” Iulia says. When you visit Connect Lounge, Iulia recommends ordering the mici—a Romanian appetizer that is a grilled blend of beef, pork, lamb and spices—and the Celebration—a cocktail made with jalapeño-infused tequila, prickly pear puree, triple sec and lime juice. You can find Connect Lounge at 2330 2nd Avenue in Belltown, or on Facebook and Instagram. If you come on a Tuesday, leave your phone in your pocket if you want to get an extra dollar off everything at happy hour. 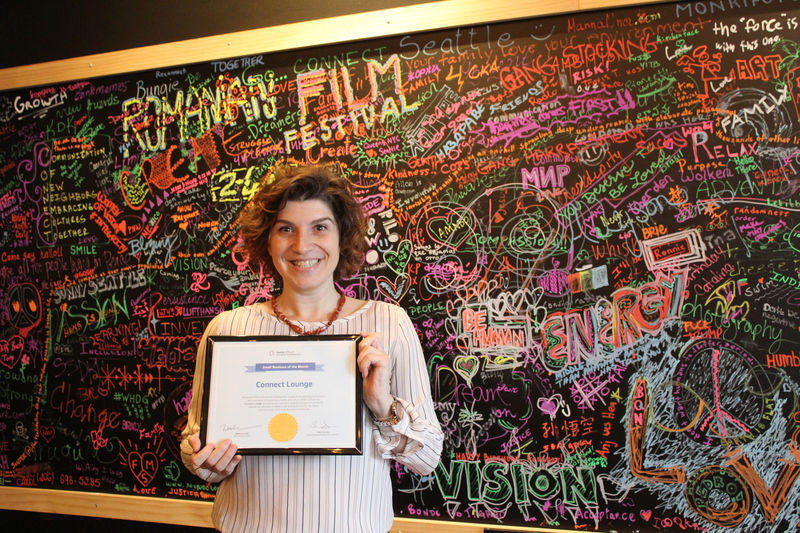 If you’re interested in learning more about loans through organizations like Business Impact Northwest, reading about previous award winners or other services for your small businesses, visit our website or reach out to us at oed@seattle.gov.